Many of you have asked how we keep our scenic backdrops is such good condition, always looking so wonderful and freshly painted. Because of this, we thought we would give you a high-level look at the process. 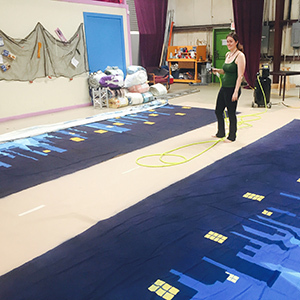 Upon their return to our facility, our quality control team opens and reviews every TheatreWorld Scenic Backdrop in detail, almost inch by inch. The backdrop is then gently cleaned. Next, we note any normal wear in our Inventory Quality Management system. 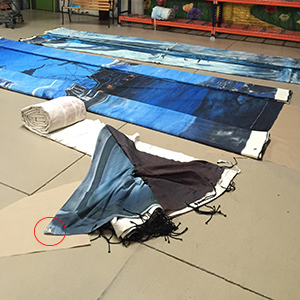 If our team finds a backdrop was poorly folded or was packed badly, we schedule the backdrop for a “Steaming Session” prior to packing it for shelving or prior to shipping to the next client. When a backdrop is damaged, our team first takes pictures of the affected area. The damage is categorized and we initiate a repair order. 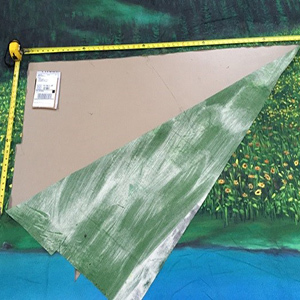 If the damage is minor, our teams tape the damaged backdrop temporarily and we schedule more extensive repairs in the near future. All TheatreWorld repairs are then initialed and dated by our team. 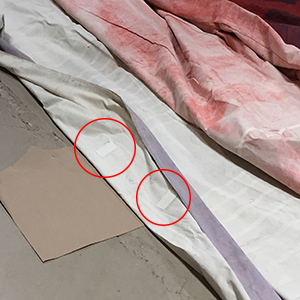 This is an example of a small tear, reasonably clean, that can be taped now and stitched later. If the damage is more serious, we produce a full Repair Work Order. The Work Order includes the steps the assessment team believes will be required to return the backdrop to top condition, eligible for use in theater productions, dance recitals, and special events. We must repair this tear prior to further use. It will require stitching. For more serious damage repairs, our processes can take several paths. This depends on where on the backdrop the damage is, how large of tear there is, or if the tear is jagged, angular, straight, or clean. 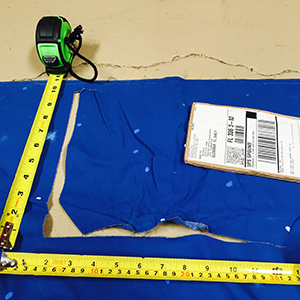 Repair operations are very labor intensive, as, minimally, backdrop handling requires two people – three if the repair includes sewing. At a minimum, major tears and rips get sewn or mended. (Again, this depends on the tear type). Our scenic artist associates then touch up these torn areas. These touch-ups consist of both airbrush and hand-painting processes, as dictated by the scenic design. Approximately 30% of major repairs require a fabric patch, which we put in place prior to stitching and painting. This is an example of a larger tear that we must repair prior to use. This tear will require not only a fabric patch, because of the jagged edges to the tear, but also stitching for reinforcement. Backdrops in the process of receiving fabric patches. Hand-painted scenic backdrops show wear differently depending on the design, paint application, method used, and color pallets chosen to bring that design to life and make it as dramatic as needed to provide your audiences with a top-flight visual experience. 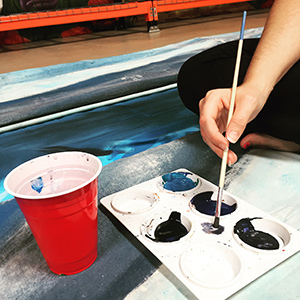 TheatreWorld’s teams look for wear indicators and will touch up our backdrops, as needed, to keep them looking freshly-painted and visually dramatic. TheatreWorld staff staging backdrops for touch-ups. Minor repairs require hand-painting only. One of our artists touching up a minor point of damage by hand. One of our Artists refreshing the airbrushing along the bottom of multiple drops. Probably the two most notable facts about our level of backdrop quality are: 1. We produce our backdrops in facilities that have been awarded ISO 9001:2008 certifications. (This is the highest standard in industry.) 2. Availability of multiple backdrops per design, on the finest of fabric, using paints from top brands of the world. 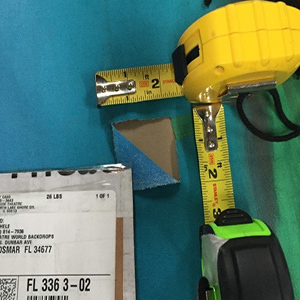 The continuity of the supply chain producing newer copies of TheatreWorld’s rentable inventories is impressive! Additionally, 80% of TheatreWorld’s backdrops are 3 years old or less. We have aggressive grading processes and will begin downgrading a small portion of our backdrop inventory this summer. We will be adding a new section to our website offering Gently Worn Backdrops for sale or rental. Our Gently Worn Backdrops will provide customers with tight budgets the option to use Grade 4 or 3 backdrops. Depending on your shows and the distance of your audiences from the actual stage and how far the backdrop is on the stage, this may be a great choice. This is an example of photos taken from a recent TheatreWorld photo shoot. Our teams are reviewing and evaluating the drops for possible downgrade because of our stringent quality standards. TheatreWorld’s Quality Control Teams have decided to never let our clients rent a backdrop with a quality grade of less than 3. These backdrops will, instead, be sold off or retired. Grade 3 stage backdrops will be available for rent at significant discounts. Our clients then may purchase these drops at highly reduced rates. Many of you have asked if you may purchase the specific backdrop at the end of your rental period. The answer is yes! You may purchase the specific backdrop at the end of your rental period, prior to returning it to TheatreWorld Backdrops. We will then subtract your current rental fee from the published purchase price. This entry was posted in Backdrop Maintenance, Backdrop Repair, Damaged Backdrops, Dance Backdrops, Downgrades, Event Backdrops, Misfit Backdrops, Signature Series Backdrops, Theatre Backdrops, Wizard of Oz and tagged backdrop rental, backdrop repair, damaged, damaged backdrops, dance backdrops, downgrades, event backdrops, misfit backdrops, musical theater, professional backdrops, quality control, Quality Control Team, quality standards, recital backdrops, Scenic Backdrops, TheatreWorld backdrops, Theatrical backdrops, theatrical rentals, touch-ups on July 14, 2015 by Skip Mathews.